For much of the early twentieth century, Route 66 was the way most people got to California. After its creation in 1926, it was the way west for migrants escaping the Dust Bowl, hoping to find work in California's fields and factories. After World War II and the beginning of America's new car culture, it carried vacationers who wanted to tour The West, visit a new-fangled attraction called Disneyland, or see the Pacific Ocean. In 1985, Route 66 was removed from the United States highway system, replaced by wider, more modern Interstate Highway, but in those six decades, it gained a status few strips of asphalt enjoy, passing into the fabric of our culture. The highway was the backdrop for John Steinbeck's Grapes of Wrath, the topic of a song by Bobby Troup and the backdrop for a 1960s television show. Steinbeck called it the Mother Road and the name stuck. If you've strolled along Route 66 in Williams, Arizona, or cruised the neons along Albuquerque's Central Avenue, don't expect to find anything comparable in California. In the eastern part of California, the Interstate highway often bypassed towns along the Mother Road, leading them to inevitable decline. Further west, San Bernardino and Los Angeles County civic leaders made changes fueled by dreams of growth and funded by state money earmarked for redevelopment. Their well-meaning projects all but obliterated the old Route 66 landmarks. Today, you'll find that Route 66 signs outnumber the remaining sights. 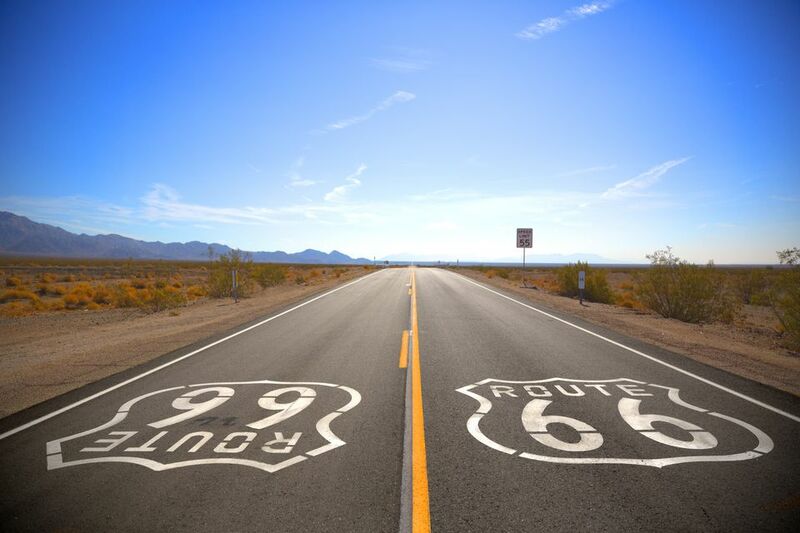 In California, Route 66 ran from the Arizona border near Needles through Barstow, across San Bernardino County, into Pasadena and south into Los Angeles, a distance of about 270 miles. Drivers making the same journey today travel on I-40, I-15, and I-10. The highway department has conscientiously signposted every possible exit from I-40 that leads to a section of Historic Route 66 and the California Route 66 Preservation Association has a mile-by-mile guide to provide historical context. Modern I-40 replaces old Route 66 across the Arizona-California border. The landscape is desert: dry and uniformly brown-hued. Even the Colorado River — which forms the state boundary — is barely noticeable. Needles is a prickly name for a little town - apparently acquired not in reference to a sewing implement but to the sharp, rocky peaks above the valley. Follow the Historic Route 66 signs through town and you'll find a few remnants. Most notable is the Route 66 Motel, whose sign makes a nice photograph. The most interesting piece of yesteryear in Needles predates the Mother Road. Near the railroad tracks is the shell of the elegant El Garces Hotel, built in 1908 to serve travelers on the Santa Fe Railroad and considered the best of entrepreneur Fred Harvey's chain. The easy way to get from Needles to Barstow is I-40. It runs through the same countryside as old Route 66. Past Needles, old Route 66 diverges from I-40 and parallels the railroad tracks. Some call this the "ghost town" section, and with good reason: Little remains of Goffs, Essex, Danby, and Summit. To see what's left, exit I-40 at US Hwy 95 north, then go west on Goffs Rd. It will return to I-40 near the town of Fenner, where you can rejoin I-40 or continue to connect with National Trails Highway near the town of Essex. If you bypassed the ghost town section, exit I-40 onto Mountain Springs Road west of Needles. It will soon change names to National Trails Highway, named for the coast-to-coast highway the predated Route 66 and now following most of the Mother Road's remains. A desert oddity that has little to do with Route 66 is the unusual graffiti along the dirt bank on the north side of the highway. Made of rocks, some of which appear to have been carried here from somewhere else, it goes on for miles. In the 1930s, Roy and Velma Crowl owned the entire town of Amboy. Today, Roy's namesake motel sign still cheerfully points to the old motel, which sits half-renovated. After almost slipping away, the town has a new owner who has managed to re-open the store next door. And the old motel's sign got a facelift when a television commercial was filmed there. Just down the road is the Amboy Crater, once a tourist attraction on Route 66. It's been 10,000 years since it erupted, but the desert floor is still strewn with its black lava. Other towns once stood west of Amboy: Bagdad, Siberia, and Klondike, but they are no more. Old Trails Road crosses I-40 near Ludlow and you won't miss much if you get on it there. If you continue on Old Trails through Daggett toward Barstow, you'll pass the California Inspection Station that features in John Steinbeck's novel The Grapes of Wrath. Built as an agricultural inspection station, it's used today for equipment storage. When 1930s migrants reached Barstow, about two-thirds of them turned north to look for work in agriculture. The rest headed for Los Angeles, as did most post-World War II tourists. At Barstow, I-40 ends, merging with I-15 which follows Route 66 to Los Angeles, more or less. Exit I-40 at Main Street to see Barstow's Route 66 landmarks. The unique McDonald's at 1161 E Main Street (at I-40) is made from railroad cars and houses a small collection of vintage photographs. Traveling along Main Street north, you'll pass old motor courts and motels including the El Rancho Motel (112 E. Main St.), built in 1943 from wooden railroad ties from the Tonopah & Tidewater railroad line. A small detour on 1st Street across the railroad bridge leads to the Route 66 "Mother Road" Museum, housed in the restored Casa del Desierto, once a Fred Harvey hotel. The quick route southwest from Barstow is on I-15. To go into Victorville, exit at CA Hwy 18 east, then turn right onto D Street. If you take National Old Trails Highway (W Main in Barstow) instead through Lenwood and Oro Grande, you'll cross a 1930 steel truss bridge over the Mojave River just before reaching Victorville, where the road becomes D Street. You'll also pass the Bottle Tree Ranch shown above. In Victorville, you'll find the Route 66 Museum at 16849 D Street. Turn onto 7th Street, which passes through downtown and past the New Corral Motel at 14643 7th Street. This original main street retains the original small-town character that existed at the Mother Road's zenith. Keep following 7th Street and signs for I-15 to get back on it. West of Victorville, the road runs over Cajon Pass, the last mountain climb before dropping into the Los Angeles basin. Midway up is the Summit Inn, a nicely-kept roadside stop that's been around since the early days. Take the Oak Hill exit to reach it. The old route went through the town of Devore, but staying on I-15 is easier and not much will be missed. In San Bernardino County, Route 66 travels west toward the ocean, running along the base of the mountains to Pasadena. Along much of the route to Pasadena, old Route 66 is now named Foothill Boulevard. To join it in San Bernardino, take I-215 south, exit at Mt Vernon and follow it south. To reach the original McDonald's location at 1398 North E St. in San Bernardino, turn left off Mt. Vernon at Base Line St, then left again on North E Street. Built before the burger chain was bought by Ray Kroc, it's now owned by Juan Pollo Restaurants and operated as a museum. Reverse your route to return to Mt Vernon and continue south. At West 5th Street, turn right. After making a small jog, the road will become Foothill Blvd. The Wigwam Motel, which could be the best-preserved Route 66-era lodging in California is at 2728 W. Foothill. San Bernardinans like Route 66 so much that they celebrate it every September with the Route 66 Rendezvous. Urban redevelopment took a particularly harsh toll on Route 66 sights in the Los Angeles basin. Sadly, only a few bits of roadside architecture remain. Here and there, an observant eye may pick out bedraggled motor courts nearly elbowed out by strip malls, but there are still a few intriguing places to stop. In Fontana, Bono's Big Orange, is one of only a few surviving roadside stands that once sold juice to thirsty travelers. An old 1920s gas station sits abandoned at the northwest corner of Foothill and Archibald in Rancho Cucamonga where a local group is working to restore it to its original condition. Route 66 followed various streets through Pasadena, but for those wanting a quick look at the city, take exit I-215 at Sierra Madre Blvd south, then follow E. Colorado Blvd. west (left) through town along the Rose Parade route, turning south onto S. Arroyo Parkway. Going south from Pasadena, Arroyo Parkway becomes CA Hwy 110, the first "freeway" in the United States, which became part of Route 66 when it opened in December 1940. At one time, Route 66 ended in downtown Los Angeles near Clifton's Cafeteria at the corner of Broadway and 7th, but it was later extended. Purists say the corner of Lincoln and Olympic in Santa Monica is the end of the route, but the Santa Monica Pier carries the title of "official" end of Route 66. Going west from downtown, today's Santa Monica Boulevard takes you there. Exit 110 at US Hwy 101 north, then exit at Santa Monica Boulevard west to follow old Route 66 through West Hollywood, where local businesses keep alive the old road's tradition of great neon signs. Few businesses remain from the old days, but along the way, you'll pass Barney's Beanery, a bar, and restaurant on the corner of La Cienega Blvd. which has been around since the early days and the historically-recognized building of the Formosa Cafe, which opened in the 1930s, just west of La Brea Blvd. Santa Monica Blvd. will take you through Beverly Hills, West Los Angeles and the city of Santa Monica on the way to the ocean. Turn left when you reach Ocean Avenue to reach the "official" end of Route 66 at the Santa Monica Pier. Don't Get Lost in California. Use These Maps Instead.